Prepared at the best, highly motivated and with a strong line-up the Mercedes-AMG teams will be taking on the Total 24 Hours of Spa (27-30 July) in Belgium: in total, eleven Mercedes-AMG GT3 from the teams AKKA ASP, BLACK FALCON, GOODSMILE RACING and HTP Motorsport will be competing at the Circuit de Spa-Francorchamps. Next to the racing action at the roller coaster in the Ardennes, Mercedes-AMG is celebrating the presentation of the Mercedes-AMG GT4 in Belgium, the latest member of the Customer Racing family of cars. The classic endurance race also marks the start of the ‘ Passion for Good’ donation campaign with which Mercedes-AMG is supporting the Laureus Sport for Good Foundation. Affalterbach – The Mercedes-AMG teams and drivers are highly motivated for the season highlight of the Blancpain GT Series in the Ardennes: at the start of the month, on 4 July, the teams tested their cars at Spa and are excellently prepared for what many drivers refer to as the ’24 hour sprint race’. 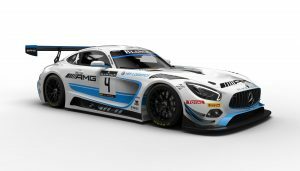 Next to three Mercedes-AMG Performance Teams, another eight Mercedes-AMG GT3 will be run by Customer Racing Teams, the largest entry of race cars from Affalterbach for a 24-hour race at the legendary Belgian race track to date. 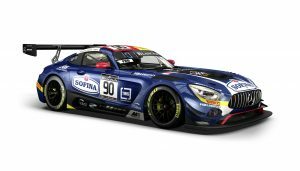 With starting number 88, the Mercedes-AMG Team AKKA ASP is running one Mercedes-AMG GT3 with extended works-support, next to two additional customer cars with starting numbers 89 and 90. 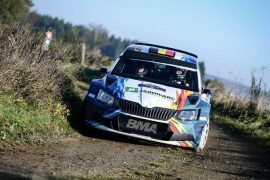 Last year, the French team already secured itself a podium finish with second place and intends to battle again for a top result in the prestigious race this year. The team receives support from Mercedes-AMG Driver Nico Bastian (GER) and Mercedes-AMG DTM Drivers Daniel Juncadella (ESP) and Edoardo Mortara (ITA). German team HTP Motorsport from Altendiez is running three cars: Mercedes-AMG Team HTP Motorsport is starting with number 84, the MANN-FILTER Customer Racing car with #48 and another AMG GT3 with starting number 85. Mercedes-AMG Drivers Dominik Baumann (AUT) and Maximilian Buhk (GER), who are also racing for HTP Motorsport in the Blancpain GT Series, want to score not only a good result at Spa, but also additional points for the drivers’ and teams’ championship. Team BLACK FALCON, based in Meuspath in Germany, is running a total of four Mercedes-AMG GT3: Mercedes-AMG Team BLACK FALCON has starting number 4 while the Customer Racing cars have been allocated #15, #16 and #18 for the Belgian endurance race. The driver line-up includes Mercedes-AMG Drivers Yelmer Buurman (NED), Adam Christodoulou (GBR) and Maximilian Götz (GER). The entry is completed by Japanese team GOODSMILE RACING & Team UKYO with starting number 00 as an optical highlight as well: with a striking ‘manga’ livery, the Customer Racing Team from the Far East that is mainly racing in the Japanese Super GT Series, will be competing in the Spa 24 Hours as a one-off. Presentation Mercedes-AMG GT4 At the occasion of the 2017 24-hour race at Spa-Francorchamps, Mercedes-AMG is presenting its latest race car: the Mercedes-AMG GT4 marks the addition of another vehicle class to the company’s Customer Racing Programme that started with the SLS AMG GT3 in 2010 and continued with the Mercedes-AMG GT3 in 2016. At the occasion of the 24-hour race at Spa-Francorchamps, the car will be shown to prospects and fans for the first time. Starting with the Spa 24-hour race, Mercedes-AMG is expanding its partnership of many years with the Laureus Sport for Good Foundation. 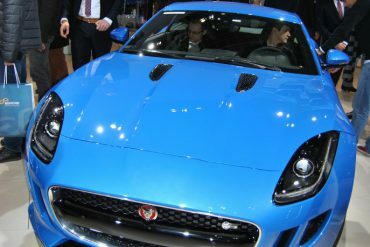 The charity foundation that Daimler and Richemont founded in 2000 is taking care of disadvantaged children and young people all over the world. The partnership is based on the Mercedes-AMG brand values that also include passion and therefore accepting social responsibilities. A responsibility that Mercedes-AMG has been putting into practice for many years with its commitment to the Laureus Sport for Good Foundation. With ‘Passion for Good’, Mercedes-AMG is continuing the ‘Drive for Good’ initiative that Formula 1 World Champion Nico Rosberg started for the benefit of Laureus Sport for good in 2015 with a new means of generating donations. Mercedes-AMG works driver and brand ambassador Maro Engel is the patron of the new charity project and, together with the Mercedes-AMG Performance Teams, he will be collecting donations for the Laureus Sport for Good Foundation by sporting achievements in selected GT3 races. In the long-term campaign, Mercedes-AMG is donating 1 Euro to the Laureus Sport for Good Foundation for each kilometre completed by the Performance Teams in the remainder of the season. Activities during selected highlight races and various communication activities complement the commitment. A symbolic handing over of the relay stick from Nico Rosberg to Maro Engel marks the start of the campaign. At the end of the year, the collected donations will be used for the benefit of the KICKFORMORE project in Stuttgart that is supported by Laureus Sport for Good. Further information can be found at www.laureus.de. 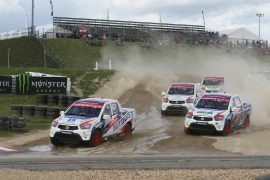 Overwinning en dubbel podium voor BMA ! 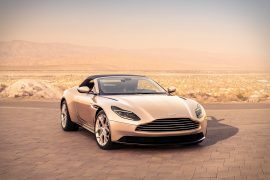 Nieuwe Aston Martin DB11 Volante.